It turns out that even coffee, one of the last few bastions in the world of simple delights, is susceptible to being raped and defiled by the beanie-toting, opinion-flinging, artisinal-everything bearded goons we all know and hate called "hipsters." Australian-based writer Jamila Rizvi called out an unnamed Melbourne cafe (for their sake) on the presentation of the "coffee" she ordered. 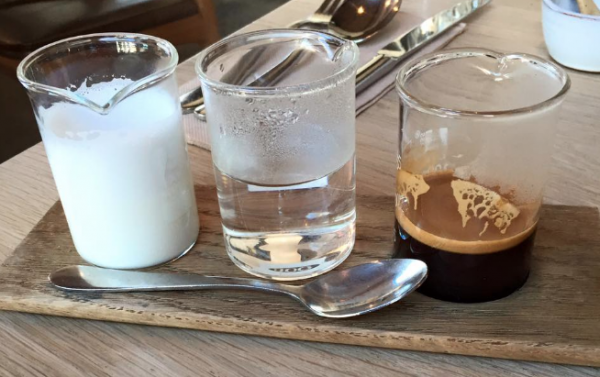 In an obvious attempt to be weird and trendy, this cafe decided to serve their coffee in three different beakers: one holding the liquidated coffee, one holding the hot water and one holding the cream. This absurd and obnoxious set up comes on a wooden board and is served with a spoon, so that you can mix your preferred amount of each ingredient into the fourth glass that wasn't provided to you, because hipsters. Granted, they'd probably give you one if you asked, but still. This really is too much. Jamila, along with a vast majority of Australians, expressed that she was getting tired of the Hipster culture and their ability to get their sticky, pseudo-weathered hands onto anything and everything that seems good and genuine. "Hipsterism has gone too far when your coffee comes deconstructed. I wanted a coffee. Not a science experiment. I prefer to drink my coffee out of crockery and not beakers. Next stage? I'll just get a chopping board with a bunch of actual coffee beans and an upside down hat on it." Some people came to the defense of these hipsters on Jamila's post, saying that they, "love this idea because you never know how strong a coffee is going to be and you can make it however strong or weak you like it." A decent idea, although if that was a big concern for you, wouldn't you just make it at home? After all is said and done, ordering a cup of coffee should always be easy and convenient. It's coffee, not a congressional bill, so take it easy hipsters.